Drone topography FAE FOTO makes georeferenced aerial drone photogrammetry with computer generated flight plans and UAV automatically executed. Photogrammetry and 3D reconstruction with drones FAE offers 3D scanning of large buildings (tens-hundreds of meters or even kilometers) in inaccessible areas with centimeter accuracy. 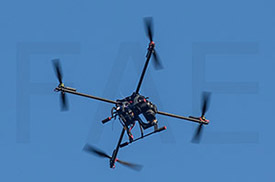 FAE team performs flights with ultra-light, cutting edge, custom built drones. The equipment is ground-controled through Radio Control and feeds live images to the ground display from afar. All equipments are electrically powered. Example of 3D interactive model of Rosia Montana, covering an area of 2000 Ha, made with topographical drone FAE1115Octa. The model is made for marketing purposes, being decimated by 20 times for loading in 50mb on Sketchfab. FAE FOTO makes aerial drone photogrammetry with computer generated flight plans and UAV automatically executed. The series of aerial photographs has a high degree of coverage, Dslr 18 Mpix resolution, constant height and are perfectly orthogonal. Read more about drone topography. FAE FOTO offers 3D scanning of large buildings (hundreds of meters or even kilometers) in inaccessible areas with centimeter accuracy. 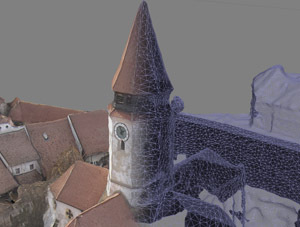 Read about Photogrammetry and 3D reconstruction with drones. Maximum altitude of shooting exceeds urban photography needs. Also quality - clarity and flight autonomy are constantly growing. If you are passionate about flying and photography and want to join the FAE team, please contact us. We are using a professional aerial plane drone type for topography and agriculture FAE 1718 Fixed Wing - REBEL drone. What cameras do you use for aerial photos ? Aerial photographs are made based on project with SONY Alpha A6000 camera or Mavic 2 Pro - Hasselblad Camera camera with brushless video stabilizer. At what height can you fly ? Yes. FAE FOTO makes aerial filming.